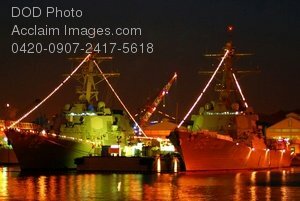 Description: Free, public domain image: Ships Illuminated at Night on New Year's Eve; Yokosuka, Japan . YOKOSUKA, Japan (Dec. 18, 2007) Holiday lights illuminate the Arleigh Burke-class guided-missile destroyers USS Lassen (DDG 82) and USS McCampbell (DDG 85) at Fleet Activities Yokosuka. Every Yokosuka-based ship of the forward-deployed naval forces is decorated with holiday lights to celebrate the festive season. Just before midnight on New Year's Eve, every ship will go black for a countdown to the New Year. At midnight, every ship will illuminate its holiday lights to bring in the New Year. U.S. Navy photo by Mass Communication Specialist Bryan Reckard. This public domain photograph may not be used in materials, advertisements, products, or promotions that in any way suggest approval or endorsement of any people appearing in the photos. Department of Defense guidelines for use.